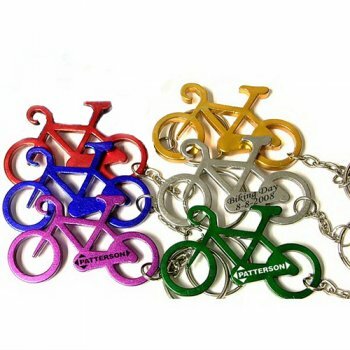 If you are looking for a token, which scores in terms of personality, inspirational value and utility value at low price, feel free to seek this customized bicycle shape bottle opener transportation keychain. It offers tour de boost to your campaign and brings you easy customers. It is great for promoting sporting goods stores, bike stores, and any lifestyle brand or lifestyle store. It will delight your customers with its unique shape and high utility value as a bottle opener and key hanger. Request a quote to know about discounts on wholesale custom bicycle shape bottle opener keychain transportation keychain. Features – Cycle shape bottle opener keychain in aluminum with metallic color finish. Product Size – 2 1/4" x 1 11/32"
Available colors - Metallic Black, Metallic Blue, Metallic Gold, Metallic Green, Metallic Orange, Metallic Purple, Metallic Red, Metallic Silver, Metallic Pink. Imprint Method - Full Color Process, Laser Engraving, Printed. 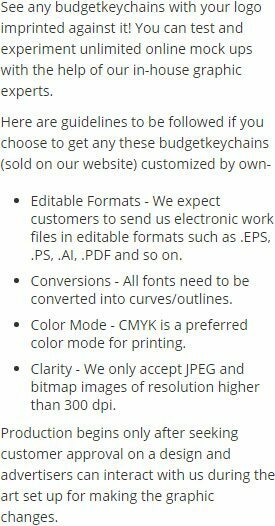 Available Colors : Metallic Black, Metallic Blue, Metallic Gold, Metallic Green, Metallic Orange, Metallic Purple, Metallic Red, Metallic Silver, Metallic Pink. Imprint Area : 3/4" x 5/32"
Product Size : 2 1/4" x 1 11/32"